The installation Braveland is part of Eutopia, an exhibition curated by Farah Yusuf for the Textile Museum of Canada. Bon Courage from the side. 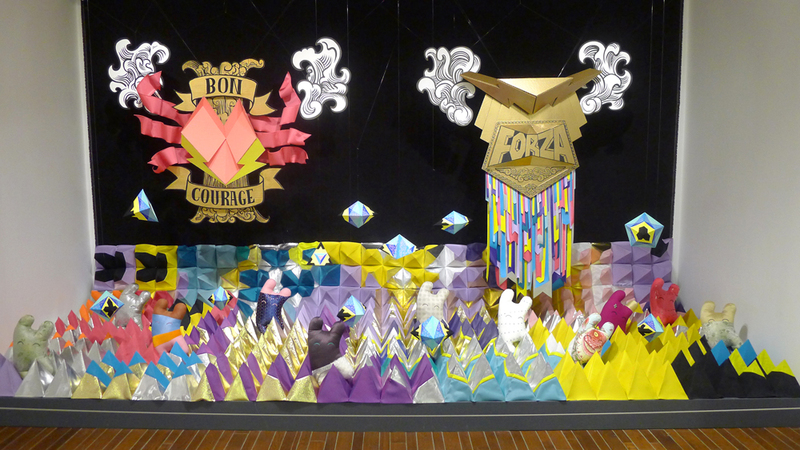 Braveland is an installation featuring large cardboard and textile sculptures resembling bravery medals that float above a geometric, textile landscape. The medals are dedicated to the audience, for the multitude of daily brave decisions everyone makes in their lives. 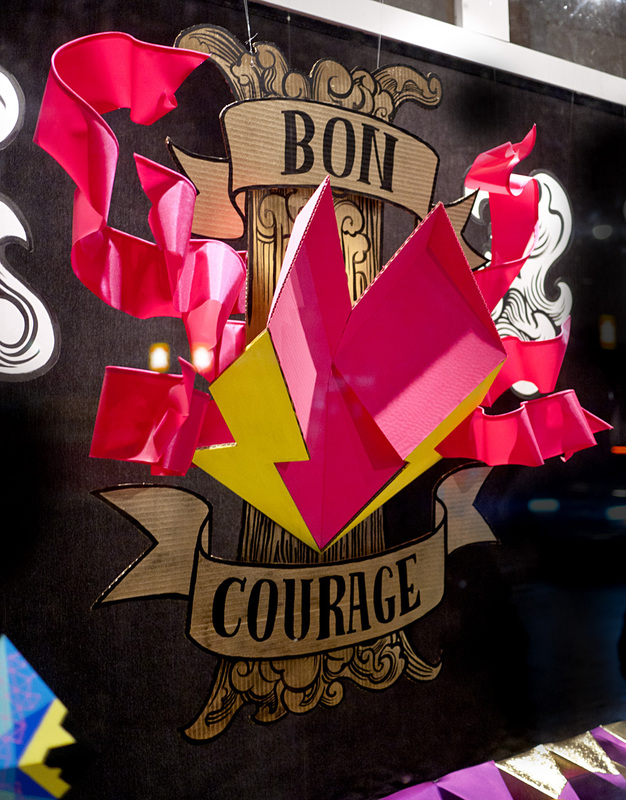 The bravery medals and the installation are part of the larger project by Happy Sleepy all about courage. What’s your vision of a better future? What would make a “good place” for you? Is it personal? Political? Who would share it? Who would disagree? By exploring the powerful association of fibre arts and grassroots activism, Eutopia – which refers, literally, to a “good place” eminently attainable in the real world, as opposed to utopia, an impossible ideal – offers personal and provocative answers to those questions. By highlighting a trajectory of historical textiles and contemporary art practices engaged in social commentary and the articulation of other possible futures, the art and artists of Eutopia seek to spark engagement, dialogue and debate. The ubiquity of textiles, their relationship to collective making and an ability to convey meaning in the context of everyday life has made them vehicles for political, cultural and economic commentary for centuries. Emerging from distinct experiences of social conditions and activated by visions of social change, each of these creative statements is personal and, ultimately, political – one voice in a dynamic dialogue within and beyond the exhibition. Alongside socio-politically charged textiles from the Textile Museum of Canada collection, Eutopia features contemporary Canadian artists who are known for reaching beyond the confines of the gallery to directly engage communities. Working locally and globally, with elements of playfulness as well as deep cultural critique, they ask audiences to consider a multiplicity of perspectives across complex issues such as gender identities, contested political terrain, and racial oppression to express their own unique eutopia. Past to present, the ideas and impulses presented in the exhibition are not static, but constantly evolving. Thank-you to the Textile Museum of Canada curator, Sarah Quinton, and the Eutopia curator and curator-in-residence at the Museum, Farah Yusuf, as well as all the other artists participating in the exhibition. Thank-you to the Ontario Arts Council for assistance with exhibition costs.